South Coast Swords brings together a diverse group of instructors with historical, real-world, and martial arts expertise. Many of our instructors are top-level competitors and are recognized as knowledgeable resources by the entire HEMA community. A multiple Gold Medalist in cutting, RJ has been practicing HEMA for nearly a decade. He has worked with the best instructors in the world, and continues to regularly attend events and compete worldwide. He has appeared as a weapons expert on television shows including Mythbusters and Man at Arms: Art of War. RJ co-founded SCS with Jonathan Mayshar, and runs the webstore. One of the founders of the HEMA Alliance, Kron Martial Arts, and South Coast Swords, Jonathan has influenced the shape and feeling of HEMA across the nation. Jonathan actively helps develop new training equipment with the SCS manufacturers, and frequently works on new ways to keep HEMA fun and exciting for everyone! Easily the most "decorated" fighter in South Coast, Jonathan has been fighting and teaching HEMA for almost a decade. He is constantly researching and thinking of new ways to implement our martial technique, and plays a heavy role in our fantastic videos! Myles is a true renaissance fighter. 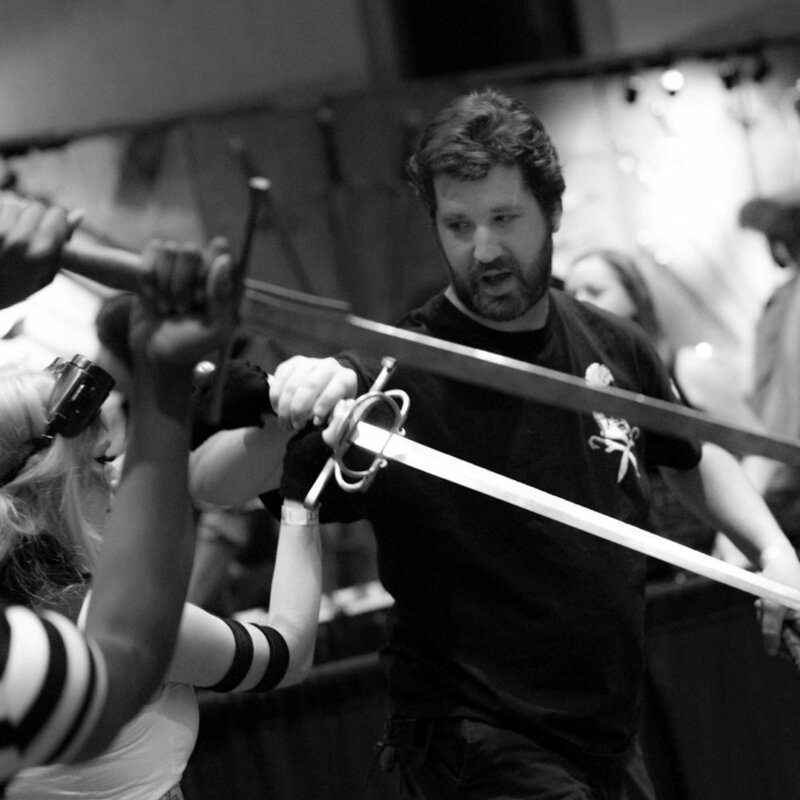 He actively studies and researches new HEMA manuals to add to his ever-growing encyclopedic knowledge of techniques. When Myles isn't reading manuscripts or competing for medals, he spends his time engineering at Disneyland. A retired sheriff, Robin has spent a lifetime studying more martial arts than any of us can count. He was inducted into the Martial Arts Instructor Hall of Fame and has competed at a national level. Robin brings a wealth of knowledge to South Coast, and is someone we all are happy to be friends with. Eric’s rapid progression is a testament to the effectiveness of the South Coast Swords system of instruction. In less than two years, he’s gone from having no prior martial arts experience to being one of our most decorated students winning medals in multiple weapons systems, as well as one of our most knowledgeable regarding the historical combat manuscripts we study. Jeremy is a blacksmith and historian with many years of research and reenactment under his belt. He has traveled extensively in Europe, handling antique arms and armor, and has hand-forged some of the most complex weapons around. If there's ever a question of authenticity of a claim (either martial or a historical fact), we can turn to Jeremy to keep us accurate.